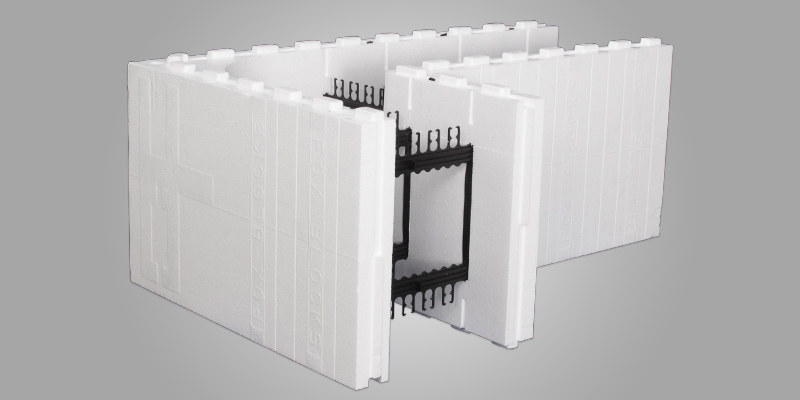 The 90 Degree Corner Block typically makes up 10-15% of the ICF wall assembly on most residential & commercial jobs. 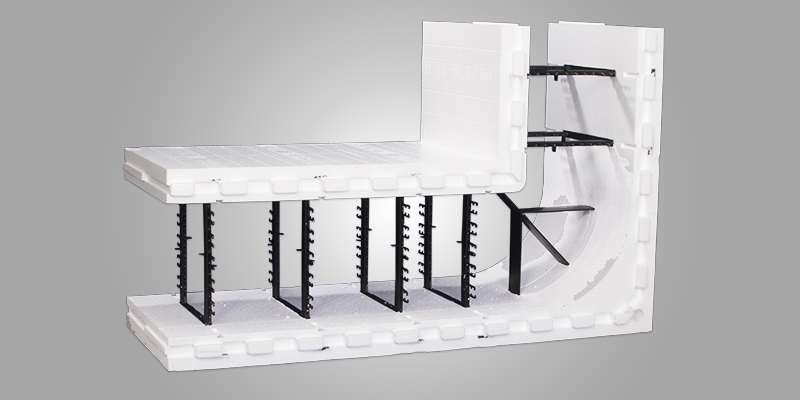 This block has six (6) strong full length injection molded plastic ties made from Polypropylene (PP)regrind resin that are well marked with the word “Fox Blocks” located on both sides of the block. 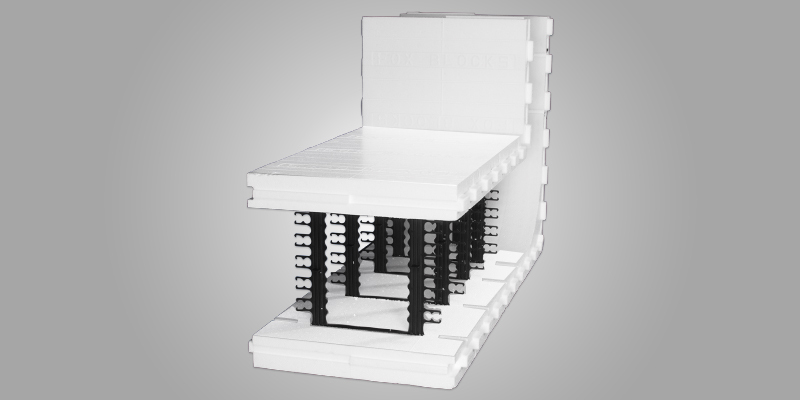 The corner block also has one (1) patent pending corner bracket designed like no other in the ICF Industry. 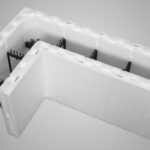 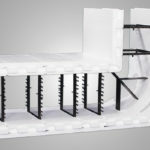 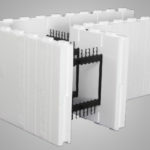 This 7/32″ thick x 1-1/2″ wide corner bracket was engineered to add more strength/support to the block because it connects the inner/outer 1.5 pcf density modified Expanded Polystyrene (EPS) foam panels together and is designed with a round through hole in the outer panel for the installation of a 3/4″ PVC or metal pipe to reinforce the corner once the wall is built to eliminate blow-outs during the concrete pour. 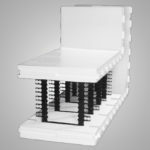 The bracket has a marketed exterior fastening surface that is very large on both sides of the block to secure exterior veneer finishes. 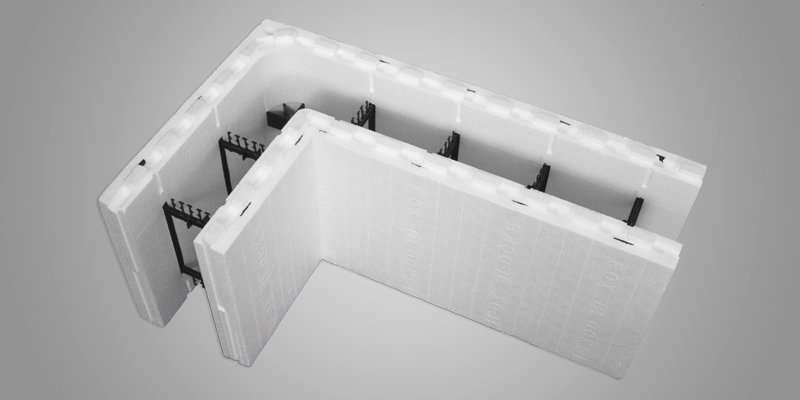 The blocks are stacked tightly together at the corner locations and inter-locked end to end to the Straight Blocks to the desired wall length. 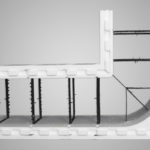 Once a single layer or course of ICF blocks is installed, horizontal reinforcing steel bars are inter-locked securely together in the ties of the blocks, then another course of blocks are placed firmly on top as the wall is built. 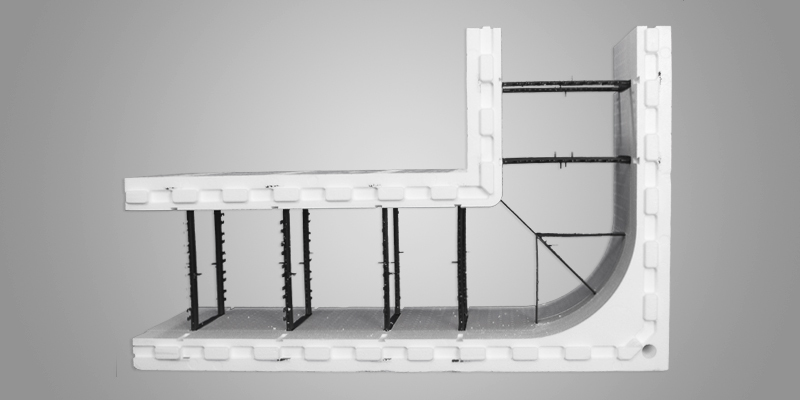 To improve construction wall strength during installation, each course of blocks should have their end-joint connections staggered in a running bond method from the course adjacent to it.